Using Technology To Keep Carbon Emissions In Check : All Tech Considered Renewable energy is only one of the steps toward achieving the goals set by the Paris climate deal. We take a trip around North America to explore other ways of keeping carbon out of the atmosphere. 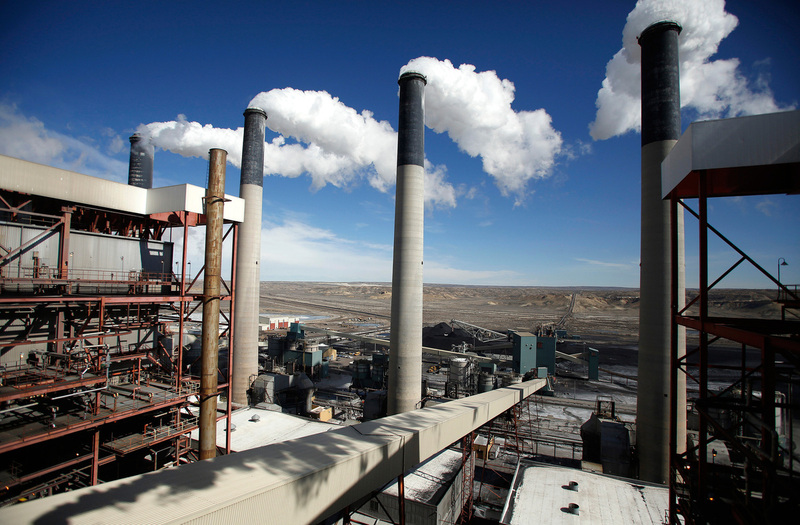 Steam rises from the stacks of the coal-fired Jim Bridger Power Plant outside Point of the Rocks, Wyo., in March 2014. NPR's Jeff Brady, KQED's Lauren Sommer, Wyoming Public Radio's Stephanie Joyce and Inside Energy's Leigh Paterson tracked down a few examples of this in North America. "With heat, we flash off the CO2," says Tim Wiwchar, Quest project manager, during a tour of the facility. After the carbon dioxide is compressed, he says, it's piped 40 miles away down a 12-inch pipeline to three injection wells, where it gets stored 1.4 miles underground. The technology in the Quest project has been around for a while, but it's still expensive: The cost of building and operating this one plant over the next decade is about $970 million. For all that money, it captures only a third of the CO2 that's produced here. For many companies, such a plant isn't an attractive investment because it's not profitable. "It creates, maybe, societal value but it doesn't create commercial value," says Shell CEO Ben van Beurden. He says having a cost placed on carbon emissions could give oil companies the incentive to build more plants like Quest. Just such a program is in the works — announced in November by Alberta Premier Rachel Notley. According to the "Climate Leadership Plan," the province will phase in a $30-per-ton, economywide, carbon price. Shell supports this and says the price should be even higher. Why would an oil company want the government to increase its costs? The key is increasing costs the same for all oil companies, which would level the playing field so Shell isn't the only one building plants like this. Van Beurden says he hopes other companies will follow — he's even offering to share what Shell learned here. But so far, he says, there are no takers. Wyoming is a big coal state, so it has paid particular attention to figuring out how to turn captured carbon from a liability into an asset. In October, Gov. Matt Mead announced the location of a new carbon-testing lab where CO2 would be "re-imagined," as he put it. 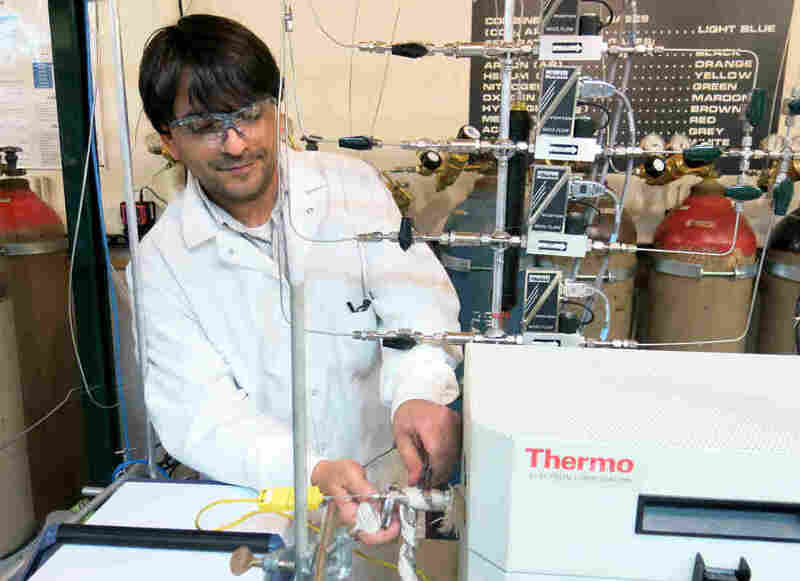 The goal is to turn harmful CO2 emissions into building blocks for useful products. Captured CO2 already is sold to make fertilizer, dry ice and plastics. It can even be used to carbonate your soda. But the demand for this kind of carbon is still small. According to the International Energy Agency, the industrial market for captured CO2 is around 200 million tons per year — or about 175 times less than the amount of CO2 emitted globally from energy use in 2013. "The willingness to pay for CO2 to use it in industry is really not stacking up in the current market context," says Simon Bennett, an analyst in the IEA's Energy Efficiency and Environment Division. Despite these odds, and a serious push from many nations to drastically cut down coal use, coal-dependent economies all over the world are hoping that low-carbon technology will allow the world to keep burning coal for electricity. "The real fly in the ointment is the technology gap between our desire to do that and our ability to do that," says Mark Northam, director of the University of Wyoming's School of Energy Resources. Bridging that gap will take time, money and government support — three huge obstacles to a low-carbon future. California's goal to cut carbon emissions has focused some of the attention on capturing and storing the carbon dioxide emitted from generating electricity. Six years ago, the company Clean Energy Systems was showing off a new kind of power plant that was meant to be a model project. It burns natural gas to make electricity, which creates carbon pollution. But the idea was to capture the carbon and put it back underground to permanently trap it in rock layers underneath a dusty lot in the Central Valley. "This is about changing the way that power is produced," company President and CEO Keith Pronske said in describing the project six years ago. "If you bring the carbon up, use it and put it back." This was meant to be a shining example of zero-emission energy. But the plant couldn't find a utility to buy its electricity, because the power was more expensive thanks to the additional costs of burying the carbon. "It's been a bit of a wild ride and we've had a few bumps," Pronske said last month. 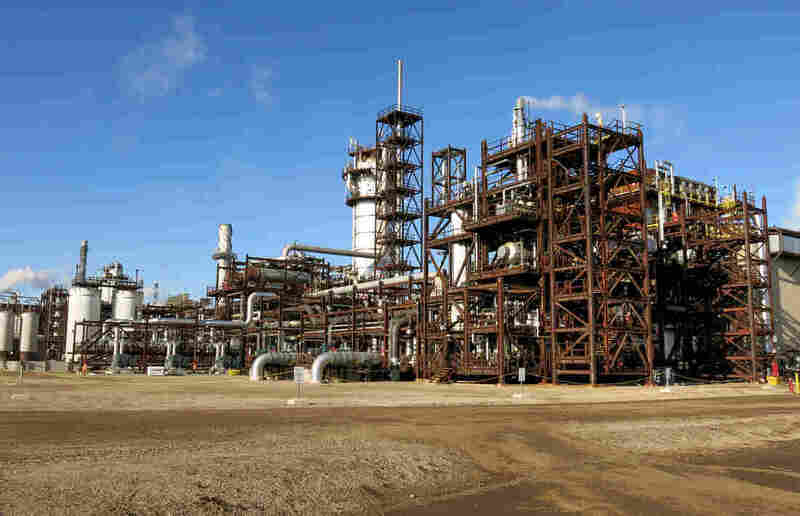 Other carbon capture projects in California aren't faring any better. The federal government offered more than $3 billion in grants, but the projects are big and complicated, and also face resistance from skeptics who worry about environmental impacts. Many projects have been canceled altogether. "The real issue is getting across the valley of death — of how do we get these first plants built?" Pronske says. In Wyoming, oil is big business and some want to put CO2 to work producing more of the oil through "enhanced oil recovery." Oil is hard to get out of the ground and producers often leave around half a reservoir's contents behind, trapped in tiny pores in the rock. CO2 can help get it out. Injected underground, it bonds with the oil molecules trapped in the rock and acts like a detergent, washing the oil out. Some of the CO2 ends up trapped, or "sequestered," underground. And that means, profits can be made from sales of more oil. "I think we are going to see more and more of these CO2 enhanced oil recovery projects go forward because there, there is an economic case to be made for that," says Kipp Coddington, director of the University of Wyoming's Carbon Management Institute. But there is a wrinkle. Unlike conventional capture and sequestration, in which carbon is just locked away instead of being reused, burning the oil produced through enhanced oil recovery can actually emit more carbon than gets sequestered underground. Even so, Coddington says it's better than a regular barrel of oil. "If you can produce a lower-carbon-footprint oil and displace a higher-carbon-footprint oil," he says, "why wouldn't you do that?" Editor's Note: This story is part of an NPR Energy & Environment collaboration with member stations.